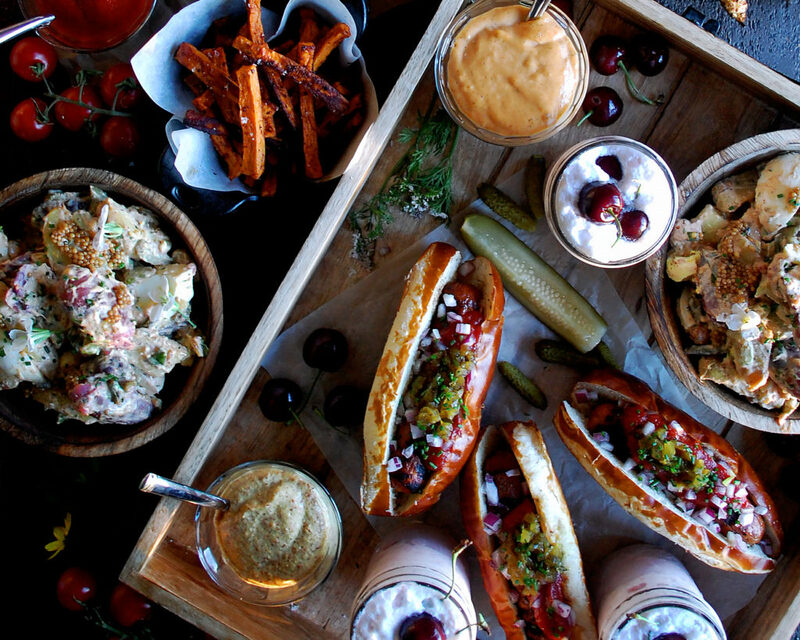 Cookouts are supposed to be fun, spontaneous, and creative…but when it comes to the ultimate summer cookout, there are definitely some essentials that have got to be included. 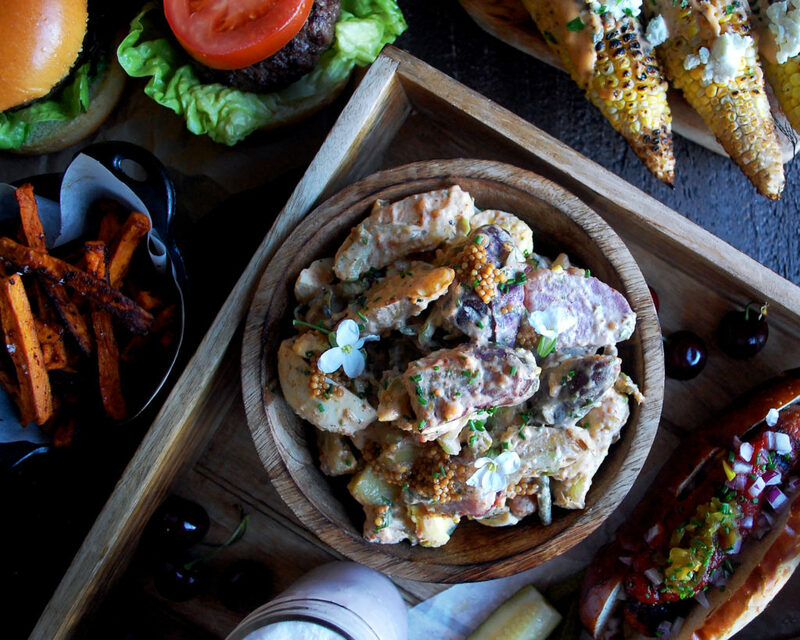 A cookout is summer entertaining at its finest. It’s casual, relaxed, and everyone always seems to have a good time. Especially when you’re hanging out on a beautiful, warm night, surrounded by plenty of amazing food…I mean what could be better? When it comes to food, I like to keep things simple, but full of flavor. 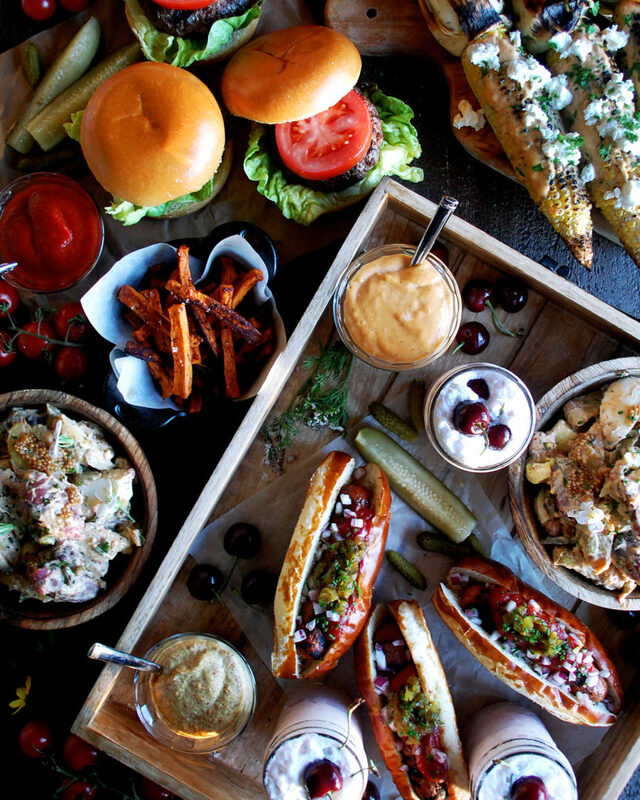 For this ultimate spread, I’ve gone the classic route by serving old fashioned hamburgers and hot dogs. I like to offer both, so everyone can choose what they’d like. You really can’t go wrong here. Instead of trying to create a new, uniquely flavored burger or hot dog while entertaining a lot of people, I stick with the basics…really good meat, fresh buns, and some traditional fixings. For the hamburgers, I’ll buy ground chuck and form them into 4-ounce patties. A simple seasoning of salt and black pepper goes a long way. I grill the burgers until charred and tender, but still slightly pink on the inside. I use brioche buns, fresh butter lettuce, and ripe tomatoes. You could always add cheese if you’d like, too. For the hot dogs (you can also mix it up with brats or Italian sausage), I like to buy mine from Whole Foods and cook them on the grill as well. I’ll top the dogs with diced red onion and relish, plus some spicy mustard. Speaking of mustard, you cannot have a cookout without some delicious condiments. And that’s why I cannot be more excited to feature Sir Kensington’s condiments in this spread. 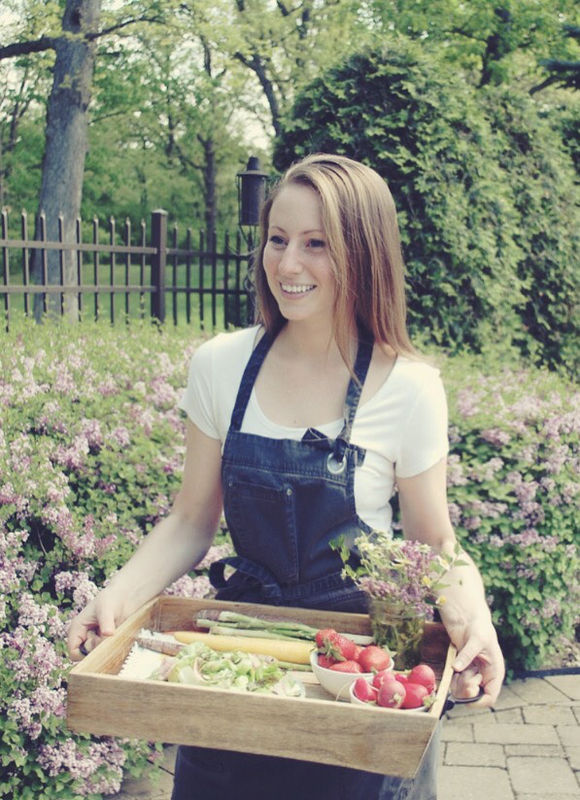 They use minimal, real, natural ingredients in all of their products…plus some seriously fresh flavor. I’m highlighting four of their amazing condiments: ketchup, classic mayonnaise, spicy brown mustard, and their oh so delicious special sauce. I like to dish each one up into a bowl so everyone can pick and choose how to top their burgers and hotdogs. And now for the really exciting part of this cookout spread – the side dishes. You know how I said I kept it classic with the burgers and dogs? Well, I’ve done the exact opposite with the side dishes, kicking all the classics up a few notches with some interesting flavors. 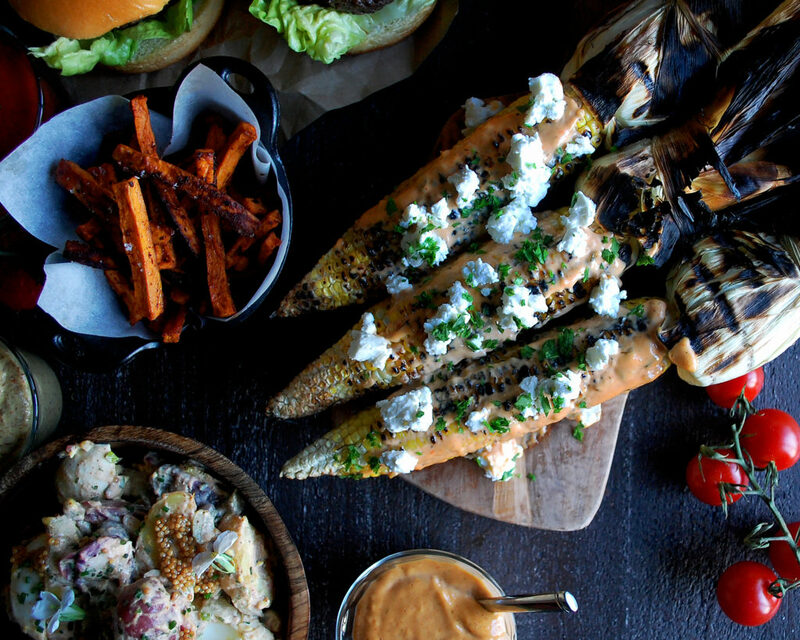 We’re talking grilled garlic scape potato salad with pickled mustard seeds, spicy sweet potato fries, and a version of Mexican street corn that includes goat cheese and Sir Kensington’s “remoulade-like” special sauce. 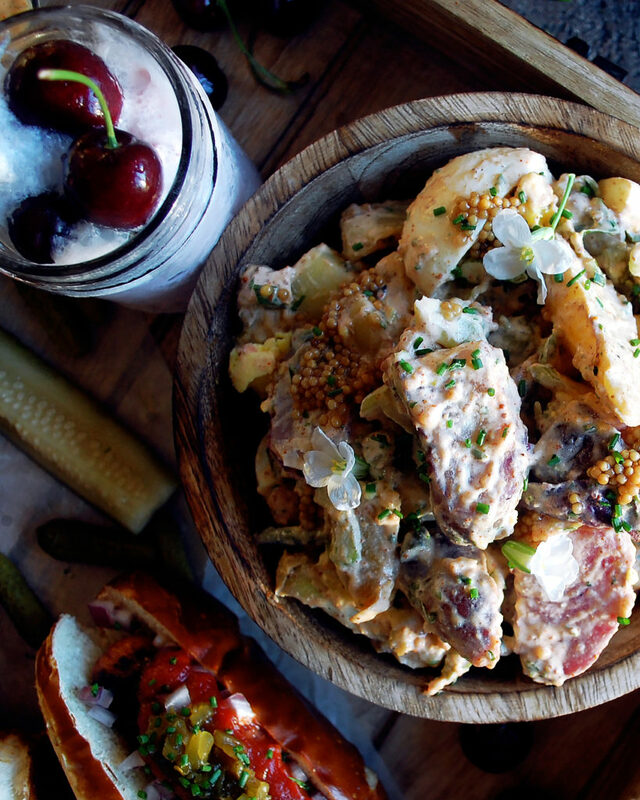 The potato salad might just be my favorite potato salad I’ve ever eaten. I use Sir Kensington’s classic mayonnaise and spicy brown mustard, plus some lemon juice and fresh herbs, to create the perfect dressing for fingerling potatoes, grilled garlic scapes, greens onions, celery, and of course some hard-boiled eggs. The finishing touch is a spoonful or two of pickled mustard seeds. To make them, just bring the pickling liquid (1 part sugar, 1 part vinegar, 2 parts water) up to a simmer, and then pour it over yellow mustard seeds. Let them sit for 30 minutes before using! They add a really nice tangy bite to the potatoes. 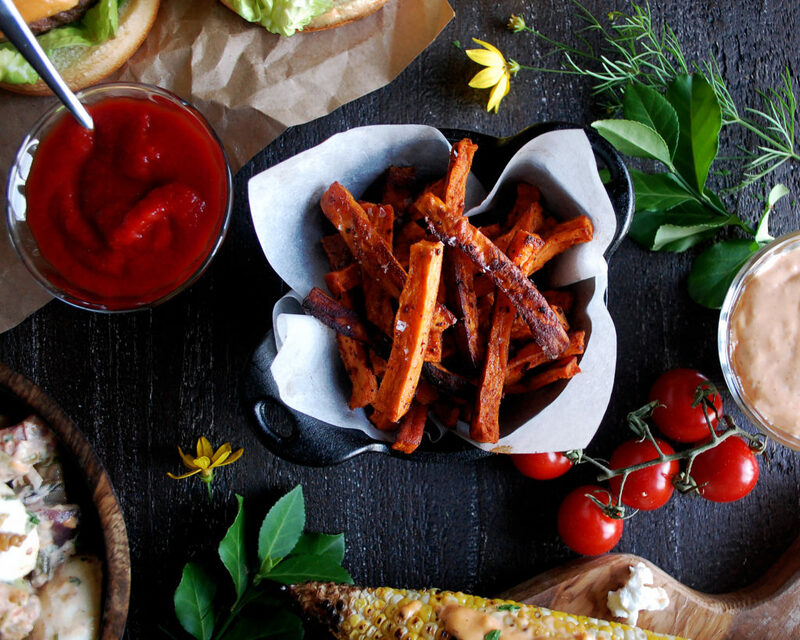 For the sweet potatoes, I made them extra spicy to pair perfectly with Sir Kensington’s sweet, vine-ripened ketchup. They’re also baked, so it’s a nice healthier option to offer people. And last but not least…the corn. It’s charred, then slathered in Sir Kensington’s special sauce, and then topped with goat cheese plus fresh herbs. Cookout perfection. And absolutely always finish with something sweet. Here I’ve made some cherry ice cream floats which are just so much fun. Two simple ingredients, cherry ice cream and sparkling water, and you’ve got yourself the perfect summer drink to finish the night off right (you can even add some vodka or sparkling wine if you’d like). Enjoy! Add the potatoes (along with a generous pinch of salt) to a large pot and cover them with cold water. Bring to a boil. Lower the heat and simmer the potatoes until they’re tender, about 12 minutes. Drain the potatoes and let them cool. Cut into halves or quarters, depending on the size of each potato. Meanwhile, heat the grill over high heat. Toss the garlic scapes with oil, salt, and black pepper. Grill them until caramelized and tender. Roughly chop the scapes. Combine the cooked potatoes in a large mixing bowl with the grilled garlic scapes, green onions, celery, and cornichons. In a separate mixing bowl, whisk together the mayonnaise, mustard, lemon zest, and lemon juice. Add this mixture to the potatoes. Fold gently until combined. Gently stir in the hard-boiled eggs, parsley, chives, paprika, and pickled mustard seeds (if using). Season with salt to taste. Serve room temperature. Preheat the oven to 375F. Place the corn (with the husk intact) on a sheet pan. Bake for 30 minutes. Let cool slightly. Pull back the husks. Cut off one of the strands and use it to tie the husks together. 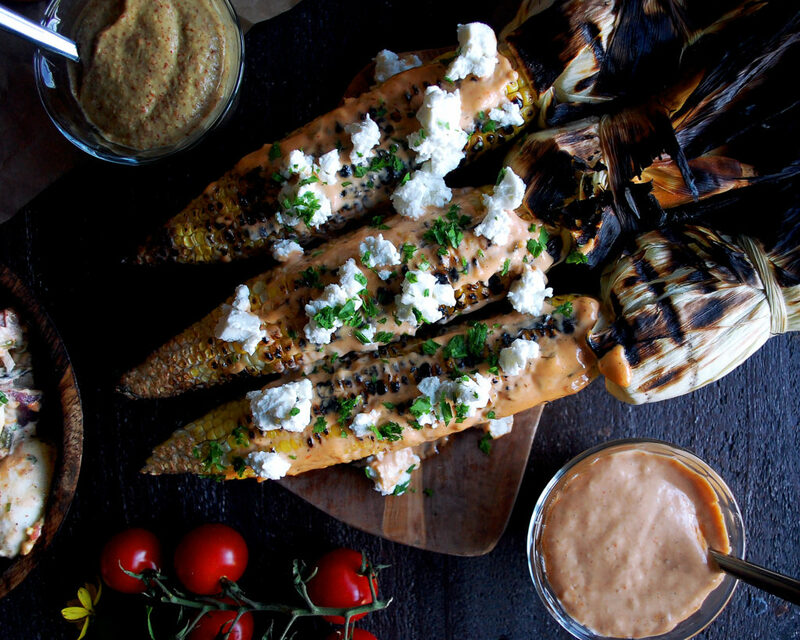 Grill the corn until charred and caramelized. When ready to serve, slather the corn with the special sauce. Sprinkle the crumbled goat cheese over top. Garnish with parsley, chives, and a squeeze of lemon juice. Preheat the oven to 425F. Cut the sweet potatoes into ¼-inch matchsticks. In a large bowl, toss them with enough oil to coat, plus the chili flakes, smoked paprika, cayenne pepper, and a pinch of salt. Spread the sweet potatoes onto a sheet pan in one even layer. You may need to use two sheet pans to ensure the potatoes have enough space to crisp evenly (placing the potatoes together will cause them to steam). Bake for 10 minutes. Lower the oven to 375F and continue to cook for 20 more minutes. Remove the fries from the oven and immediately season with another pinch of salt. Serve with ketchup. Scoop the ice cream into mason jars or any other type of glass. Pour the sparkling water over top to reach the edge of the jar. Garnish with fresh cherries. 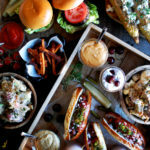 Serve the grilled potato salad, goat cheese street corn, spicy sweet potato fries, and cherry ice cream floats alongside classic hamburgers and hot dogs. Serve extra dishes of condiments on the side.